Do people love their dogs too much? 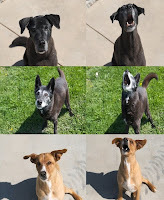 Meet the Rohr dogs…Pepper, Rocket and Lucky. Do people love their dogs too much? I visited my bffs Lisa and Lisa last weekend. They love their dogs a LOT. We went to a lovely pet accessories store. Did you know that you can spend over $1,000 on a custom-fit, tempur-pedic dog bed? Lisa and Lisa spent a small fortune on Stella’s upcoming birthday party favors. Stella the Shih Tzu turned four years old on Monday! While we were in the store, we met lots of dogs. Funny how you will talk to the dog before acknowleging the person. “Hey, sweetie, aren’t you the best dog!” A little scratch behind the ears. Then, you’ll look up at the owner, a kindred spirit who totally gets why you think her dog is so darn cute. Dogs connect us. It seems that dogs – as messy, loving, stinky, lovable, noisy, loyal and inconvenient as they are – make people more…human. This week, in The Challenge, we are describing and documenting our Perfect Life. Mine includes lots of land and dogs to trod it with. You can not love too much.